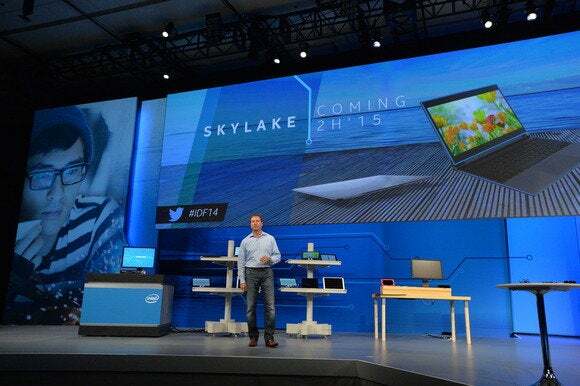 Fancy a Mac or Windows 10 PC with Intel's new processors code-named Skylake? That will soon be possible: Intel will launch its first chips based on the new architecture in the first week of August. The first Skylake chips will be high-end gaming processors that can be overclocked, and will be launched on or before August 7 during the Gamescom conference in Cologne, Germany, which runs from August 5 to 9, according to a source familiar with Intel's plan. Intel will also shed more technical details about Skylake at its Intel Developer Forum, which will be held between August 18 and 20 in San Francisco. Intel will talk about how Skylake will improve the experience of using Microsoft's Windows 10, which will be in PCs starting July 29. Intel declined to comment on the launch of Skylake chips. But one can expect Skylake chips for mainstream desktops and laptops to come in quick order during or after IDF. Intel's goal with Skylake is to make PC usage more convenient. With that in mind, Intel has talked about "wire-free" technologies in Skylake so PCs could charge and transfer data to peripherals wirelessly. Dell, Hewlett-Packard and Asus will ship Windows 10 PCs based on Skylake in the second half this year. It's not clear when the chip will reach Macs, and Intel tends not to speak on Apple's behalf. Some Skylake features are already known. Asus last month showed all-in-ones and mini-desktops based on Skylake with support for the new DDR4 memory and USB 3.1 data transfer protocol. PCs based on Skylake will also have ports based on Thunderbolt 3, a new technology that runs on USB Type-C cables and can transfer data at 40Gbps (bits per second). One interesting technical session at IDF will detail overclocking the Skylake gaming desktop chips being announced in early August. In other sessions, Intel will demonstrate Skylake PCs running Cortana and Windows Hello, a new Windows 10 biometric feature in which faces, fingerprints or eyes can replace passwords. Skylake also has new virtualization, boot, system management and lockdown features, which will be detailed in technical sessions. Intel has hurried to get Skylake to PCs so it can close the curtains on the troubled predecessor Broadwell chips, which were delayed due to manufacturing issues on the 14-nanometer process. Intel has resolved manufacturing issues so Skylake processors are rolled out on time. Skylake will take on AMD's chips code-named Carrizo, which are now reaching PCs. AMD is rushing to release its next-generation chips based on a CPU core code-named Zen, which will be in PCs next year.